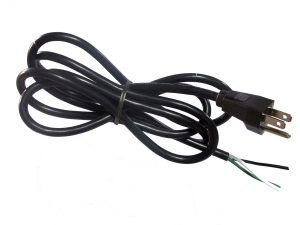 This 73 NEMA 5-15P fan power cord is a three-wire grounding device for 125v circuit use. With a durable construction this heavy-duty cord supplies power to your cabinet cooling fan. Sufficient power enables your fan to run efficiently and prevents heat damage to internal components and electronics. Purchase in bulk orders to receive a special GardTec discount! For a combination package including cooling fan, fan filter assembly, and power cord, check out our cabinet cooling fan kits.